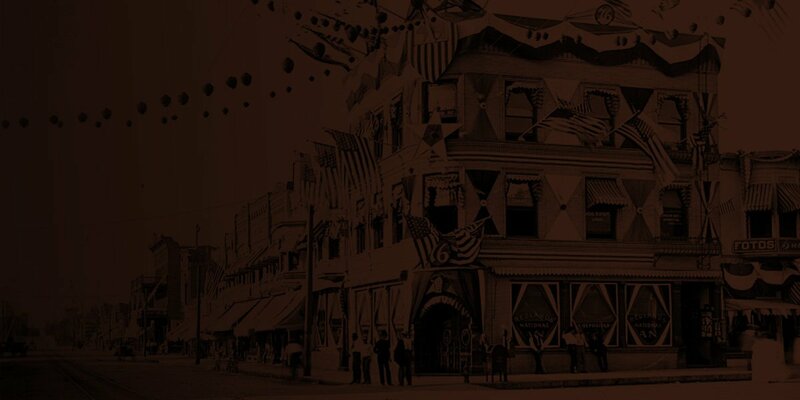 Dr. William P. Burke purchased 3 acres in Redlands Heights from Jonathon F. Pierce in 1910. The following year Burke and his wife, Sarah, had a handsome one-story frame residence constructed on the property by J. Kavanaugh for an estimated cost of $8000. A two-story, frame and brick barn was built later the same year for $1000. This Oriental-influenced Craftsman home features flared and multiple-planed roofs decorated by two interior chimneys. The cross-gabled design shelters a wood shingled 1 ½ story home upon a brick foundation. Wide, unenclosed eave overhangs surround the structure and exposed roof rafters have both triangular and rectangular knee braces. The entry porch is supported by square wooden columns upon brick piers that continue into the porte cochere, with its square, brick columns set on a brick wall. The single, upper-story room contains ribbon windows which drop into the wall when open. Bay windows grace the north and west sides of the home. The front door with its original hardware has a center panel of stained glass flanked by side lights. Tall, north-facing mullioned windows offer unobstructed panoramic views of the mountains and San Bernardino valley. East and west gables contain vents constructed of vertical openings, which are repeated in the barn. Also repeated in the barn are the wood shingles and flared roof. The barn’s lower story of brick has a wooden plank door that bears evidence of having been chewed by horses. The guest house, built sometime in the 1940s echoes the features of the main house with its wood shingles and ornamental chimney. Dr. Burke was a physician with Burke, Avey & Burke, whose offices were located in the Masonic Temple building on Cajon Street. The practice included J.L. Avey and William’s son, Edward W. Burke. In 1909 Dr. Burke became a member of the Fortnightly Club of Redlands, a literary and social club, and presented many papers from 1911 to 1920 including “Bacteria and their Products” and “The Need of Manhood in Citizenship.” Dr. Edward Burke and his wife, Ruth, lived in the home from 1921 to 1941. 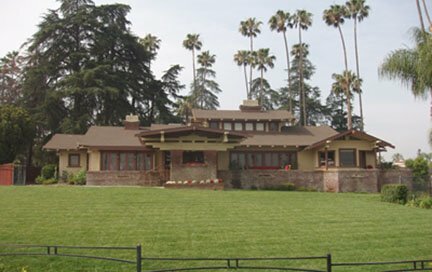 In 1929 Dr. Burke purchased the former residence of the Higgins family on Center Street and turned the enormous home into the Redlands Heights sanitarium. The 1941 city directory lists the Bow C home as “vacant” and the following year it was acquired by Louis P. and Esther Scherer. Mrs. Scherer was on the board of directors of the Redlands Golf and Tennis Association in the 1940s. Mr. Scherer was a general contractor and builder whose offices were located at 208 1/2 Orange Street. He owned and operated Scherer Constructors and Scherer Home Builders Inc., which built more than 950 homes in the greater Redlands area. By the time of his death by heart attack at age 85, he had served on the board of the A.K. Smiley Public Library for almost 30 years, and his company had built or worked on 19 local schools and numerous commercial buildings. He also constructed the Landmark Tower in Las Vegas that was later acquired by Howard Hughes. The Scherer’s sold the home to Laszlo and Amine Varga in 1976, and the Varga’s in turn sold it to Frank and Gloria Chesus in 1983. Thomas and Dee Catlin owned the property when it was subdivided in 2002. When Thomas and Sylvia Hoffman purchased the home in 2003 the plumbing and electricity had already been updated. The Hoffman’s had the interior floors refinished, reclaimed the park-like grounds and planted an orchard. A Model T resides in their restored carriage house, which features new mahogany garage doors complete with windows to match those in the main house. The Redlands Area Historical Society is pleased to recognize the current owners, Thomas and Sylvia Hoffman, for their hard work and love of this historic Redlands property. Researched and written by Marie Reynolds.